I learned about HEXBUG® toys last year when it was at the top of my two boy’s Christmas wish lists. They really enjoy playing with these little robotic critters and it remains one of their favorite toys that they play with on a regular basis. The latest HEXBUG® toys that are sure to be a hit this holiday season are HEXBUG® Warriors Battling Robots. Kids can “let the battle begin” by using these futuristic fighters (micro robots) to outmaneuver their opponents in the Battle Arena and Stadium competitions. The HEXBUG® Warriors Battling Robots use vibration to move forward and “battle” just like our collection of HEXBUG® Nano creatures. The allure of HEXBUG® to my young boys and all of their neighborhood friends is quite impressive and you can often hear the sounds of cheering as their HEXBUG® Nano and HEXBUG® Warriors Battling Robots compete in the “Battle Arena” where the young “students” practiced their skills. They love that the LED displays shows the “damage” to their Warriors and state that this is the “coolest feature ever!” The Battling Robots also have actual running motors and there are two modes of play including a “Training” and “Battle” mode. 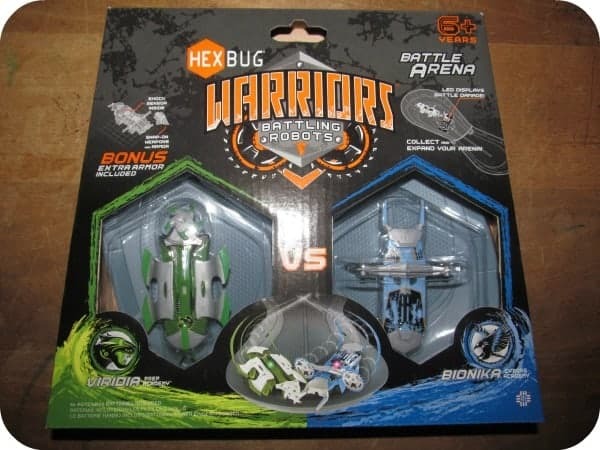 Kids can collect all of the HEXBUG® Warriors in toy line and expand their arena. The pieces were quite easy for them to connect and as we add additional HEXBUG® Warriors play sets they can ultimately design their own “Mega Stadium” which is their expressed goal for the future. HEXBUG® Warriors Battling Robots is a hot toy for boys (and girls too) this holiday season and make great gifts and stocking stuffers. You are invited to visit the HEXBUG® website to learn about this exciting, fun toy micro robot collection which is affordably priced with HEXBUG® Warriors Battling Robots Singles starting at $7.99 each and the Battle Arena and Stadium priced between $19.99 and $29.99 each. Want to see the HEXBUG® Warriors Battling Robots in action? You can watch a short video which shows how it works at the website too! Great gift idea and at a great price. I bought my nephew an Hexbug last year and he loved it. I’m sure he’d love this too. I have a 5 year old son and I have never heard of these! Sounds like something he would really love though.. He sure gets into stuff like this! My nephew would just love these! He’s crazy about any battle-type toys. And the LED feature really is pretty cool! Thanks for the good gift idea. My grandson would love this, he loves anything with lots of action play! Just this summer, my grandson was talking about his hex bug. He loves it! I didn’t know what he was talking about so he showed me at the store and told me he wanted a track. I learned that he really has a nano hex bug, but there are several out there. I overheard a couple of kids talking about warrior bedbugs the other day. While I don’t see the attraction, kids are loving them. This looks a very fun game that either of my two nephews would love for Christmas! I think that all kids would love to play the battling Robots game! My boys love Hexbugs, and I’m sure they’d love getting the Hexbug Warriors for Christmas this year! Thanks for the review! I’ve never heard of this product, but I can guarantee that my son would love it! He loves robotic and remote controlled things. I’ll have to check them out further!